QUINCY, Mass.--(BUSINESS WIRE)--All instances of "Marquette" in release dated April 3, 2019 should now read "Maquette." Quincy Mayor Thomas P. Koch today presented the Maquette of John Hancock to Robert Hale, CEO of Granite Telecommunications, a $1.4 billion provider of communications services to multilocation businesses and government agencies. 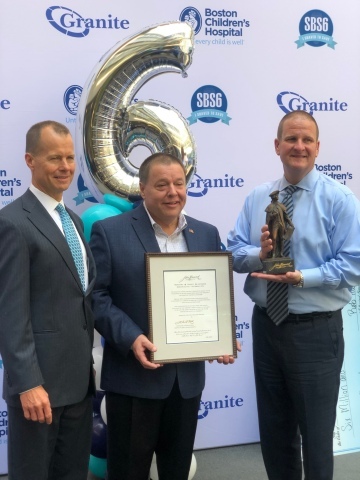 The presentation coincided with Granite’s 6th annual “Saving by Shaving” event, wherein more than 1,000 people shaved their heads or donated their hair to earn $6.5 million in donations for pediatric cancer research at Boston Children’s Hospital. In the past six years, more than 8,000 people have participated in the event raising more than $28.5 million for charitable organizations. The presentation coincided with Granite’s 6th annual “Saving by Shaving” event, which raised $6.5 million for Boston Children's Hospital.